A rare key; this is thought to be one of only two known. Made by Bunnell, it is enclosed and insulated by a steel cover. This is a small key: the cover (and the Bakelite base) measures 2-3/8" wide x 3-1/8" long. The front adjustment screw nearest the shorting lever is the gap adjustment, the rear adjustment is spring tension. The metal nameplate reads: W.U. TEL CO., LEGLESS KEY 5-A, MFD. BY J. H. BUNNELL & CO. It was invented by Robert Steeneck of New York, NY in 1929. 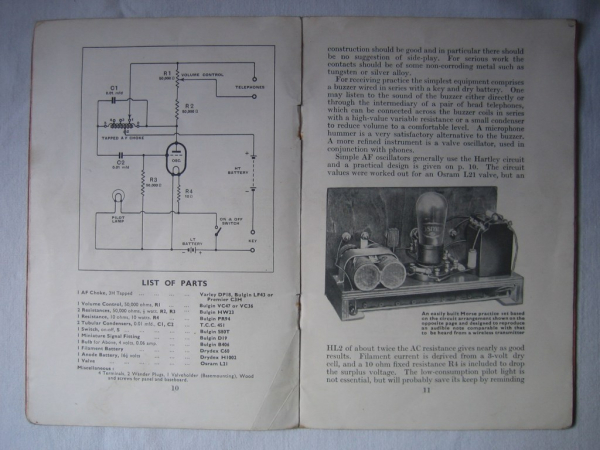 His design, like many military spark keys, totaly enclosed the key to minimize exposure to the operator of any voltages that may be present, including the exposure to a wedge used with a Vibroplex or similar auxiliary key used in offices. The key lever and the spring and height adjustments are isolated from the line, and the circuit closer is isolated when the key is open. Also, the blades of a wedge off a Vibroplex can be inserted deep into the base of this key leaving just the insulated part of the wedge exposed. His patent number 1,773,325 was assigned to Western Union and granted on August 19, 1930. Purchased. Feb. 2014 from: Peter Malvasi. W2PM. Manhatten Electric Supply Company. New York. MESCO. Brass lever Spark Key. Circ 1910. All brass key stamped MESCO circ 1910. This is the "Triumph" key designed for spark use. It has no shorting switch and has an all brass lever. The silver contacts measure 1/4 inch in diameter. Manhatten Electric Supply Company. New York. MESCO. Improved steel lever key (Legless) first advertised circ 1897. J.H. Bunnell ‘Skeleton’ based steel lever legless key 1898 – 1906. B.M.P. Company ‘Triumph’ pattern hand key post 1918. The above key is a nice, cadmium plated ‘Triumph’ key which as is stamped on the shorting lever B.M.P Co. so it is presumed this key was manufactured by them to the "Triumph" pattern of J.H. Bunnell. Further research is required to establish the history of B.M.P. Co.
Western Union Telegraph Company Legless Key 2-A made by Kellogg Switchboard & Supply Co. In 1870, Milo G. Kellogg moved to Chicago from New York State and began working as a design engineer for telecommunications equipment maker Gray & Barton, which soon thereafter became Western Electric. In the late 1880s, he left Western Electric and began designing telecommunications devices on his own. By the time he had founded Kellogg Switchboard & Supply Co. in 1897, Kellogg had registered well over 100 patents, some of which would revolutionize the telecommunications industry. Kellogg Switchboard & Supply soon threatened the dominance of AT&T by selling its superior “divided-multiple” switchboards to the newly created independent telephone companies around the country. After Kellogg fell seriously ill in 1901, AT&T secretly purchased his stock in Kellogg Switchboard from Mr. Kellogg's temporary trustee. The Illinois Supreme Court cancelled the surreptitious acquisition in 1909, and Milo Kellogg regained control of his company after eight years of phantom ownership by AT&T. After Mr. Kellogg's death that same year, Kellogg Switchboard continued to grow, eventually supplying equipment to AT&T's Western Electric. During the mid-1930s, Kellogg still employed about 400 Chicago-area residents. The company's entrance into the dial telephone business in 1939 buoyed sales, which hit $10 million by the mid-1940s. In 1952, Kellogg became a division of the International Telephone & Telegraph Co. (ITT). It was soon re named ITT Kellogg, and many of ITT's telephone manufacturing operations were moved to the Kellogg plant on Cicero Avenue in 1959, where 1,000 people were employed. All of ITT Kellogg's Chicago operations were moved to Tennessee in 1962. ITT Kellogg changed its name to ITT Telecommunications in 1965 and was sold to a French company, Alcatel, in the late 1980s. This key was originally thought to be manufactured between late 1870s and early 1880s, prior to J.H. Bunnell’s release of his Steel Lever Key in 1881. It has since been established that Josef Steiner filed his design on 8th May 1893 serial number 473,362 and was subsequently patented on 5th December 1893 with the patent number of 509,964. It is an unusual brass key with plated lever consisting of parallel circular rods. The transverse pivot bar is stamped and reads ‘Pat App'd For’ and is complete with shorting switch but missing its spring. It is a unique design and although looked very different to the stamped steel lever keys produced by Bunnell, the claims that it “produced a lever that was light, rigid and of neat appearance, and which shall at the same time be simple and cheap in construction” probably weren’t fulfilled. I personally would have thought that the construction of the lever would have been quite an expensive exercise and when Bunnell’s lever could be stamped out it isn’t surprising that this design was short lived. J.H. Bunnell Steel lever Legged key. Patented Feb 15 1881. The above key was manufactured from 1880 to September 1906. After that date the Logo on the lever changed from stating the patent date of Feb 15 1881 to having BUNNELL in a rectangle stamped in it’s place. The steel lever key patented by Jesse Bunnell in 1881 was not called the "Triumph Key", although the steel lever design was certainly popular. The top of the line key that was specifically called the "Triumph" did not show up until twenty five years later. This early and rare hand key was designed for The Western Electric Company probably around 1885. I have not yet been able to find the patent or the designer of this key but it is unique in the fact that the pivot posts are fixed to the base by countersunk machine screws and aligned by a single support bar between the two. It has an oval shaped brass base plate with a circular hole through it. This key is manufactured completely from un-plated brass and has a steel lever. The lever is longer than most and is nickel plated and the shorting bar is stamped with the mark of the Western Electric Company. This key appears to have been made before the bases were cast in one piece so it might have been an early prototype or a short production run. 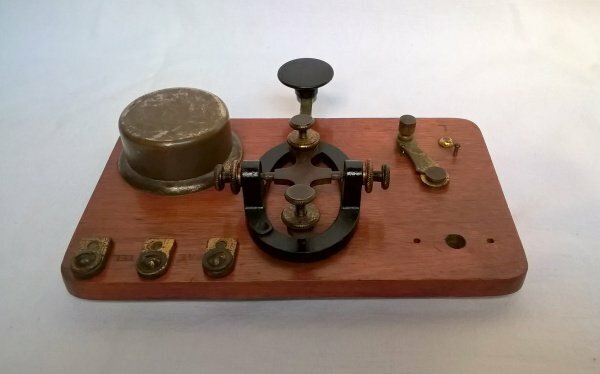 I have only seen one other example of this key and that was a legged version which is shown and described by Tom Perera W1TP on his site, W1TP TELEGRAPH & SCIENTIFIC INSTRUMENT MUSEUMS, a link to this great site can be found in my Links page. This example was obtained from Delta, British Columbia, Canada in November 2016 and is in wonderful original condition, a great find for the collection. Signal Electric Manufacturing Company R64. Heavy Duty Key for medium duty spark gap transmitter applications circ 1920. Signal Electric started out in the 1890s as Menominee Electric Co. since they were located in Menominee, Michigan. The company built and sold telephone and telegraph equipment. The company also built some wireless items like loose couplers and other electrical parts. The name was changed to Signal Electric Manufacturing Company and they remained in business until the 1960s when they were purchased by a Thermos company. The hand key shown above is a Signal Electric Mfg. Co. - Heavy Duty Key. These were available with different size contacts depending on the intended service. This key has 3/8" contacts for medium duty spark gap transmitter applications. The Signal key is identified by a manufacturer stamping at the rear of the key base between the connection terminals. This particular style of hand key was also built and sold by other manufacturers, like the Standard Co. but doesn't have the Navy style finger rest and has smaller 5/16" contacts. Standard keys are not manufacturer identified. Most of the Standard Co. types of keys are brass construction with a gold lacquer "wash" applied. The "Mac Straight Key" was the first hand key McElroy offered. The 2-5/8 x 5-1/8 inch cast iron base has two mounting holes toward the front (operator's) end, so it can be screwed to an operating table, two small holes at the rear on which can be mounted an optional "Hummer" (a 1 Kc mechanical oscillator, for code practice), and a third (larger) hole at the back for the Hummer wire (this hole can be used as a mounting hole if the Hummer is not attached). 100, Amateur model, black plastic, cadmium plated parts, no switch (Mac's term for the circuit closer). B200, black plastic "Professional" model, chromed parts, with switch. G200, same "Professional" in grey plastic. In 1941, the plastic key was offered as the S-100 "amateur model" (from the spring-summer 1941 catalog, and in comparison to the metal models): black plastic with switch. A 1942 photo of the key as part of a practice set (ad, on cast iron base with the Oscillatone) shows the S-100 as a black plastic key with circuit closer and wedge lip on the connector strap. It is not clear what the "speed key lip" means, since there is a wedge lip on the anvil contact connector strap of every one I have seen. However, since this is a plastic key, it requires another contact underneath that strap for a bug wedge. There is a cast hole in the base of every plastic key for such a contact. But I have seen only one plastic key with that lower contact installed (it is a bolt, with a strap under the base connecting to the opposite wire terminal), and that key was a cad plated Amateur model ! That's Mac, being his usual unpredictable self. T. R. McElroy Model 200 Streamkey circ 1943. This is the model 200 Streamkey made by T.R. McElroy around 1943. During the war, McElroy was busy making equipment for the Signal Corps, and key production was taken over by Telegraph Apparatus Company of Chicago (McElroy was a partner in T.A.C.). This example is identified as being manufactured by McElroy by the design of the lever which has the same width between the tension screw and the knob; TAC hand keys have a bulge in the lever at the contact. Note that the late McElroy hand keys and the TAC keys both used hex hardware. Hand keys, also called straight keys, were made by T.R. McElroy from 1937 to 1943. During the war, McElroy was busy making equipment for the Signal Corps, and key production was taken over by Telegraph Apparatus Company of Chicago (McElroy was a partner in T.A.C.). The TAC hand keys have a bulge in the lever at the contact; this distinguishes them from the McElroy keys on which the lever has the same width between the tension screw and the knob. (Note that the late McElroy hand keys and the TAC keys both used hex hardware.) This key is missing it’s shorting lever. This is a near mint condition example of this inexpensive wireless key from the late 30’s – early 40’s. With a folded sheet steel spring bearings. For the amateur that wants an inexpensive, high grade wireless key, here is the proper instrument. It is equipped with a heavy, cast, well insulated base in a black finish, coin silver contacts, composition knob and nickel parts. Type R-50. Codeword-SEMCS. Net Weight. ½ lb. Shipping Weight. 1 lb. List Price $1.50. Speed X Metal Hand Key No 305 circ 1940. Speed-X Heavy Duty Hand Key No 320. Circ 1940. Black wrinkle enamelled extra heavy Die Cast Base. Large sturdy polished chromium plated key arm with adjustable steel bearings. Heavy brass connector strip concealed under base. Well insulated for heavy duty work. Improved Navy Type Knob and ¼” pure silver contacts. Net weight 12 oz. This wonderfully designed hand key was designed and by Charles Lewis from Chicago, Illinois. Assignor to The Western Electric Company was assigned patent No 297,819 dated April 29 1884. It is the second and rarer version of the Lewis Key with the first version being patent in 1876. The main difference is that the first version has a central pivot position similar to most hand keys where this version pivots from the extreme end. The reasons behind this was to give the contacts a wiping motion when opperated thus keeping them clean. This example is missing the top part of the spring tension adjuster and shorting lever, also the button appears not to be standard. This is a rare key and is the a great addition to the collection. This key is the scarcer of the Steiner keys being the legless version and designed in the shape of a cross, with two holes for fixing to a desk. This key carries a stamped mark of Western Electric Co. New York and patented on Dec 21 1886. It is identical in all other respects to the legless version with a patent number of 354,814. The Steiner design went against normal practice having a spring of strip steel spring mounted on a rear mounting block which eliminated the need for standard trunnions and the use of centralising adjusting screws, although it does have a spring tension adjusting screw mounted above the spring. It is a stunning design being Nickel plated and was manufactured by Western Electric Co at their manufacturing plant in New York City. New York. This example has had the shorting lever removed but is still a great key. J.H. Bunnell Steel lever Legless key. Patented Feb 15 1881. A legless version of the legged key, which first made an appearance in 1880, was introduced in the spring of 1881. The steel lever on the above example carries the stamping 'patened Feb 15 1881' and the central area of the base has the mark of J. H. Bunnell. New York. This legless key was intended for use on "fine desks" that could not be subjected to the holes necessary for the under the table connections to a leg key. The "Legless Pattern Steel Lever Key" had a solid brass base and provided top mounted binding posts. The solid base key was built until 1898 when the base was replaced with a hollow version that the Bunnell Company referred to as the "skeleton" base. This is a Spies Polechanger Key, made by Spies Electric Works in Chicago. 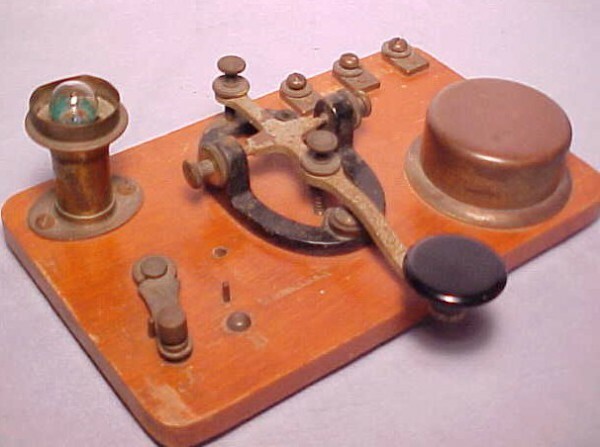 It was used by Western Union for testing telegraph lines of different polarities. The lever is made of steel and Nickel plated with other parts Cadmium plated the key has a heavy duty black plastic base. There is a three position switch on the base that selects the polarity of the line. This key dates from the period 1930- 40. Philipp was with Western Electric Co. for a number of years before starting his own business, Spies Electric Works, in 1899. He made telephone and telegraph equipment and later got into the manufacture of automatic signaling equipment for fire alarm systems. Spies Electric Works was initially located above Mathias Klein's blacksmith and tool shop (for which Mathias built a second story) on 564 W. Van Buren St. in Chicago, but eventually moved to 85 W. Van Buren St. He retired from running Spies Electric Works in 1949, and handed over control to his two sons Raymond (Sr.) and Philip (Sr.). This beautiful little strap key was manufactured by J.H. Bunnell and is the double contact model, with three terminals and contacts on both side of the strap. Bunnell made a heavy duty double contact strap key manufactured for railway use and was identified by the bevelled edge on the top face of the mahogany base. This type of key was designed as a good portable key for testing and temporary use. Being a strap key, it is quite heavy to use and would make hard work if required to be used on a daily basis. This example carries the stamp mark of J.H. Bunnell & Co. New York. U.S.A. and with the design of the terminals this key would be dated from between 1910 and 1940. This is a nice early example of the classic “Beeko” key with thumb screw terminals as opposed to the later screw down terminals. This key was patented by Gustave A Zundel and designated Patent No 770,549, dated September 20 1904. The design is based around the idea of manufacturing a cheap and durable supporting frame being especially desirable for the cheaper grades of instruments, such as learner sets. Although many thousands of these were made, because they were sometimes treated as toys due to their construction, many were discarded which now makes them scarcer to find for collectors. Although this particular key bears the stamped mark of J. H. Bunnell and Patented along with the sounder which just bears the stamping of Patented, I have seen learner sets with the “Beeko” style key and sounder and bearing the MESCO markings on the sounder arm. I have searched for a reference why these were given the name “Beeko”, but to date with no success so any help with clearing this mystery up would be welcome. This beautiful brass lever camelback key was manufactured by J.H. Bunnell. It probably started life on a telegraph set comprising of a sounder, two terminal posts and this key. At some time in its history it was separated from the sounder and mounted on a timber base along with the two terminal posts. When I received it, the base was split and not repairable so I re-mounted it on a varnished mahogany base and now is fully usable as it would have been 158 years ago. The key comprises of a brass, camelback lever with a pressed steel pivot pin mounted on a black painted cast iron base with gold pin stripe decoration. It has no spring tension adjustment just a contact gap adjustment screw. It carries the stamp mark of J.H. Bunnell & Co. New York. On the shorting lever and dates from 1860. The above example is complete with 8 out of 10 International Code Tapes, 5 of which are on early wooden spools rather than the later plastic ones and is an earlier example with wind-up motor. This is a rare practice Key on Board (KOB) set where the key can be switched between the light bulb and the buzzer. The wood base is 4-1/4 x 7 inch and is stamped ‘L’ and ‘B’ on the two switching points and ‘BAT’ and ‘TEL’ between the three terminal screws. The lamp stand, switch lever and buzzer cover are brass. The R-69 Practice Set is for those who want an inexpensive instrument. Consists of a key lever, non-adjustable buzzer and code plate mounted on a metal base equipped with binding posts and rubber feet. Has a maroon finished base and gold lacquered key lever and buzzer cover. Signal Electric Manufacturing Company Ltd. Wireless Practice Set R-68 circ 1940. Designed for those who want a well made instrument to learn the code. Set consists of a key and high frequency buzzer mounted on a mahogany finished wood base equipped with binding posts. The code is printed on a plate and fastened to the base between the key and, buzzer. The adjustable buzzer is type R-60 having a resistance of 2 ohms. Net weight 1 1/8 lb List price $3.40. in 1941 catalogue. This example is complete with carrying case and instruction booklet and is in extremely good condition. In this practice set is represented value that appeals to the beginner. Set includes two R-69 instruments, 75 feet of wire and an instruction manual packed in an attractive illustrative box. Net weight 2 1/8 lb List price $3.75 in 1941 catalogue. The above example has instruments that are in near mint condition and is complete with the instruction manual. Unfortunately the wire is missing and the box has some marking to the outside but is complete and not torn. This key is designed for learners who want something that is scientifically correct but moderate in price. Has black enamel metal base and is mounted on a mahogany finished wood base. Key lever is nickel plated. Contact points are platinor. It has a net weight of 12oz and in a catalogue of 1941 was priced at $2.50. This key is in good condition and is nice to find one with the Signal Electric transfer in good readable condition on the underside of the base. This practice set has been put together by a radio amateur using parts readily available from old radio parts. It comprises of a J.H. Bunnell “Triumph” Hand Key, an amplifying transformer 2nd stage model 375 by Freed Eisemann, a “Paragon” rheostat by AMCO (Adams-Morgan Co), a four pin valve holder along with a phone jack, LT and HT battery terminal points. They are all mounted on a discarded section of radio facia which still bear the markings of their original use. 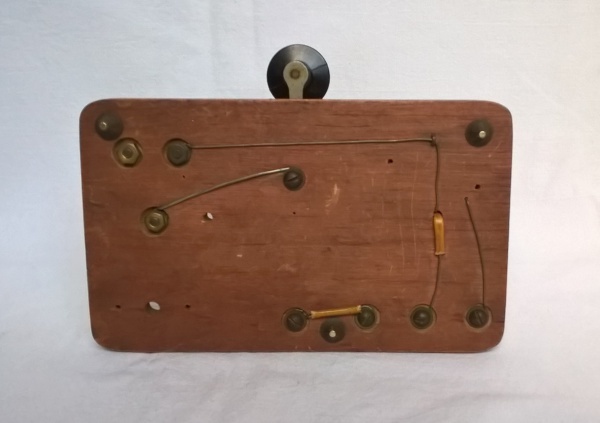 This sort of practice set was widely promoted in magazines like Wireless World and booklets promoting learning and practicing of Morse Code including circuit diagrams. This example was purchased from the U.S. in 2017. The National Automatic Telegraph Transmitter circ 1900. This fully working clockwork operated practice set used pre-punched paper tape records which were read after being drawn through the reader. This had a sprung loaded pin which dropped into either the slot or hole which in turn made an electrical contact and operated a sounder powered by the batteries. 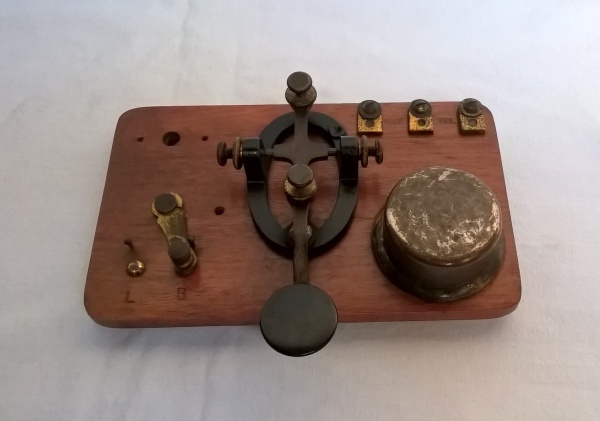 These were sold in two versions, The price of a complete outfit including the key, sounder, motor and tape reel, all mounted on a polished oak base, two cells of batteries and an entire series of records (10,000 words) and the Telegraph Instructor, a practical and complete telegraphic text book was $20. The same outfit without the key, sounder and batteries like this example was $16.50 and were sold on 15 day approval. It has a simple governor which when operated by rotating a screw on the top plate could regulate the speed from 5 to 40 words per minute. These sets were believed to be the best self-teacher of telegraphy on the market in an advert which was printed in Popular Mechanics magazine in 1905. The Telegraph Instructor by G. M. Dodge was a famous text book used by the students of the Dodge Institute of Telegraphy renowned to be the most completely equipped school in the world and the only institution in which a student could become entirely qualified for a position and was endorsed by the officials of the Western Union Telegraph Company. Their home study course of instruction was given through this unit and shows images of it within the book. The edition I have is the Third and revised edition dated 1903 so dates this set accurately.